The HD PVR captures at resolutions from VGA/D1 (480i) up to 1080i, and encodes the component inputs in real time using the h.264/MPEG-4 video codec and the AAC audio codec. The streams are muxed into a slightly modified MPEG-2 Transport Stream container. Capture resolution is dependent on the source (ie 720p video with be captured as such, 1080i as 1080i, etc.) but the bitrate is user-selectable from 1 Megabit/second up to 13.5 Megabits/second. The h.264 video codec is, bit-for-bit, up to 40% more efficient than the MPEG-2 video codec commonly used in US HDTV broadcasts today. A 13.5 Mb/s h.264 stream is roughly equivalent to a full-channel-bitrate MPEG-2 recording at approximately 19 Mb/s. The HD-PVR uses modern codecs capable of exceptional compression rates at excellent quality. The tradeoff is that decoding h.264 material is very processor-intensive. If not using VDPAU, even systems which easily play back US broadcast HD are likely to fail altogether when playing back recording from the HD-PVR. Hauppauge recommends a dual-core CPU as a minimum if not using VDPAU; a frequently cited minimum for medium-bitrate h.264 playback is a Core 2 Duo 1.8 Ghz processor. HD Playback Reports acts as a repository for processor requirements to play High Definition material. HD-PVR users are encouraged to contribute to the page to ascertain real-world playback requirements with MythTV. In all HD-PVR firmwares later than 1.0.3.53, AC-3 muxing via S/PDIF is available, allowing one to mux the original 5.1 channel audio track into the captured stream. To enable this functionality, be sure to set the audio input to S/PDIF by editing the capture card definition in mythtv-setup and setting the preferred input device to S/PDIF. Note: If you are running a firmware earlier than 1.5.6, you should update the firmware as soon as possible. Hauppauge has fixed a bug that can under certain conditions cause the HD-PVR to become inoperable. Note: As of Linux Kernel 2.6.30 the driver for the HD-PVR is now included by default. No compiling of the driver will be necessary assuming you have compiled the driver into the kernel. The development branch of the HD-PVR Linux driver is available from the LinuxTV project. Currently, firmware loading is unimplemented in the driver. As a result, if you have a "rev c1" unit you must install the HD-PVR at least once on a Windows machine to load the firmware into it. If you have a Revision 2 unit (including a sticker marked "rev c2" on the bottom of the unit) then it will come loaded with a firmware. Once you have done so, you will need a working build environment, Mercurial, and kernel headers installed on your system. In Debian and debian-based distros, the following command should install all necessary dependencies to build the driver. audio_encoding 3 to 4 3 Control for Audio Encoding. 3=AAC, 4=AC3. The audio_encoding selection only works for PCM input. If the HD-PVR is fed AC3, then AC3 will always be muxed into the H.264. Note that the picture controls currently do not have an effect as of kernel 2.6.31.
default audio input: 0=RCA back, 1=RCA front, 2=S/PDIF. For firmware 0xf, this must apparently be set to 2 to enable 5.1ch AC3 recording, otherwise it records stereo only. MythTV 0.22 now includes support for the HD-PVR. See below for caveats and setup information. Once the tuner has been added as an encoder in MythTV, it is vital that the user not access the tuner in outside programs such as cat, VLC, and mplayer. This can lead to MythTV's connection with the driver becoming unstable, and subsequent recordings failing until the driver is reloaded and power is cycled on the HD-PVR. The last sync with libavcodec did greatly improve stability when playing material from the HD-PVR. If you still get playback crashes, try compiling myth with --disable-ssse3. Myth can become non-responsive due to run-away "mythbackend --generate-preview" processes. If you check your mythbackend logs and see it being flooded with ac3 or faac errors, it is likely the "generate-preview" process doing it. A "pkill -f generate-preview" will return your myth system to a usable state. You may even want to add that pkill to a cronjob. The HD-PVR previously had problems gracefully dealing with resolution changes but those issues have been fixed. You can now allow your receiver to float between 480i, 480p, 720p and 1080i without causing the HD-PVR or MythTV to hang. The HD-PVR is completely usable when using Myth 0.22, just make sure you are using the latest HD-PVR firmware. As of September 1, 2009 IR blasting and receiving is tentatively working. Jarod Wilson has created patches for the lirc and hdpvr drivers. He's in the process of having his patches approved and committed. #6611 adds a "signal monitor" for the HD-PVR, which should improve LiveTV. The latest version of #6611 requires #6719 to be applied first. While neither of these patches are necessary to record via the HD-PVR, they are recommended for LiveTV users. Please report if these patches either improve or cause problems with your installation -- Especially with non HD-PVR capture devices. Add a new capture card. When prompted, select "H.264 Encoder Card (HD-PVR)" as the card type. Set the /dev/video node to the number of your HD-PVR. Finish adding the new capture card. You can also set the audio input on this screen. All cables must be functional and properly attached in order for capture to succeed with the HD-PVR. If every recording fails with a "Unknown type, recording width was 0" error in the mythbackend log, it is possible that one of your cables is faulty or has become disconnected. Enter option 3, "Video Sources." Set up a video source for your HD-PVR's tuner as described in the manual. Enter option 4, "Input Connections." Connect the video source to the appropriate input on the HD-PVR. Important Note: You must set a channel change script for the HD-PVR to work properly. If you don't care about channel changes, you can set it to /bin/true, but there absolutely must be a channel change script defined. Important Note 2: You must leave Preset tuner to channel empty or LiveTV and channel changes will not work. Assuming you followed the directions carefully, you should now be able to record with the HD-PVR. If you get "Select Timeout" errors, these can sometimes be overcome by stopping the backend, removing the hdpvr module, cycling the power on the HD-PVR, modprobing the hdpvr module, and restarting the backend. You can set the bitrate for the HD-PVR by going into Recording Profiles, and editing the profiles associated with HD-PVR encoders. These recording profiles have bitrate settings for low (480i/p), medium (720p), and high (1080i) resolution material, allowing you to set appropriate bitrates based upon the resolution of the material. If the max bitrate is set lower than the average bitrate, the result is CBR (Constant Bit Rate) at the rate specified by the average slider. If you want VBR (Variable Bit Rate), set the max slider to maximum, and then use the average slider to achieve the desired bitrate. Fedora Core 12 currently has built-in support for the HD-PVR's IR blaster. In Fedora 12 follow the steps below to enable the IR transmitter. Other distributions may need custom compiled drivers. See the section below to compile drivers for the IR transmitter. The HD-PVR, as with many other Hauppauge on-card emitters, only supports a fixed set of IR codes. The HD-PVR includes a wide variety of codes for most common set top boxes, but it may or may not contain codes for special buttons like arrow or menu buttons. See below for more information on codesets and lircd.conf. 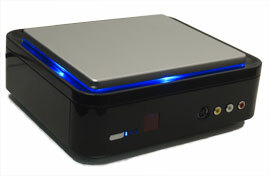 The HD-PVR's IR blaster must be supported in both the LinuxTV driver and the LIRC driver. If your distribution doesn't include support for the IR blaster you may build it yourself. The instructions below were written using a Mythbuntu 9.10 installation, but they should be applicable to other distributions. Begin by downloading and extracting the patched HD-PVR and LIRC drivers. These files were extracted from Fedora 12. If needed, install the tools you need to compile the drivers (kernel headers and a build environment). For Debian, Ubuntu, and Mythbuntu, issue the following command: apt-get install build-essential linux-headers-`uname -r`. Enter the hdpvr folder and issue the command make to build the HD-PVR driver. Enter the lirc folder and issue the make command to build lirc_dev.ko and lirc_zilog.ko. Note: This tarball contains an updated version of the LIRC driver framework, lirc_dev. If you have other lirc devices on this box you'll need to download and compile updated drivers for them as well. Copy the needed source to this working folder and re-issue the make command to build additional modules. See the LIRC source code included in your distribution. Be sure that mythbackend and any other processes that may be using the HD-PVR are stopped. Unload the HD-PVR driver (sudo rmmod hdpvr). Stop LIRC and any processes that may be using it. Find and back up your existing HD-PVR module (locate hdpvr.ko). Replace the existing hdpvr.ko with the one compiled above. Find and back up your existing LIRC modules lirc_dev.ko and lirc_zilog.ko. Replace the installed lirc_dev.ko and lirc_zilog.ko with the new versions. Load the HD-PVR driver (sudo modprobe hdpvr) and check dmesg for errors. Load the LIRC module (sudo modprobe lirc_zilog) and check dmesg for errors. Note: Be sure the HD-PVR firmware file is in place BEFORE you load the driver. If the firmware is missing modprobe will segfault and the new modules may lock up. Follow the steps to enable the IR transmitter. Plug the IR emitter in to the HD-PVR. Affix the sticky portion to the front of your set top box, aligned towards the box's IR receiver. Install LIRC as appropriate for your distribution. Note: If your distribution does not package a sufficiently recent copy of LIRC to include support for the HD-PVR IR emitter, you may need to compile it yourself. Download the HD-PVR IR firmware. Put the firmware in your distribution's firmware directory, (commonly /lib/firmware). Download the lircd.conf file and place it where your distribution keeps LIRC configuration files (commonly /etc/lirc/). Find the LIRC hardware.conf file in the LIRC configuration directory and edit it to include the following. You may have to adjust the device and socket values depending on your particular setup. Restart LIRC and if needed load the module, lirc_zilog (modprobe lirc_zilog). Check dmesg to see if the module has successfully loaded. Look at the codesets supported by the HD-PVR. The codes that start with a 0_ are for cable and 1_ are satellite. Use this script to send a power command to your Set Top Box. When the STB changes power state, the terminal will show which command set was used. Edit /etc/lirc/lircd.conf and remove the codes you don't need and (optionally) rename the ones you do. For instance 0_125_KEY_POWER becomes KEY_POWER. At this point the IR transmitter should send the codes properly to the STB. Channel changes will still require a channel change script.